Whole Indian Gooseberries are pickled in raw Tamarind extract. Bettada Nellikayi Rasa pickle is prepared in regions of Mysore and Bangalore. 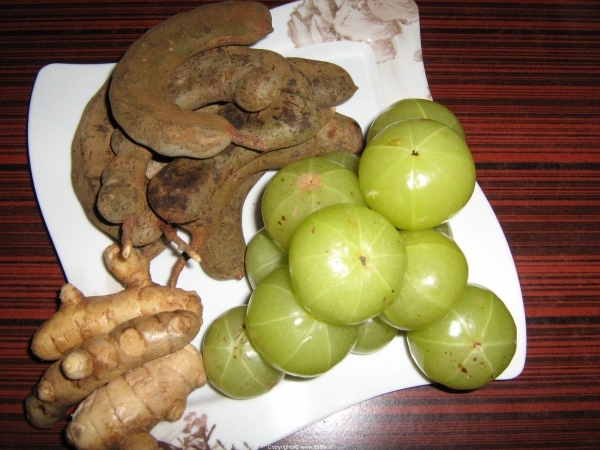 Wash Gooseberries, Raw Tamarind, Magali Beru, Mavinakayi Shunthi and Green Pepper and dry them on a cloth. Boil 2 Cups of Water with ½ Cup of Salt and let it cool. 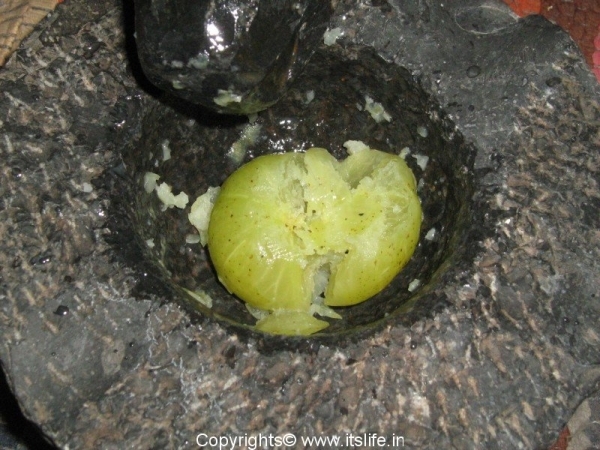 Crush Gooseberry one by one using a stone as shown in Picture1 and keep it aside. Peel Magali Beru and Mavinakayi Shunthi and chop into small pieces. Heat Oil and fry Mustard Seeds, Methi, Asafoetida and Turmeric Root separately. Grind these to a powder. 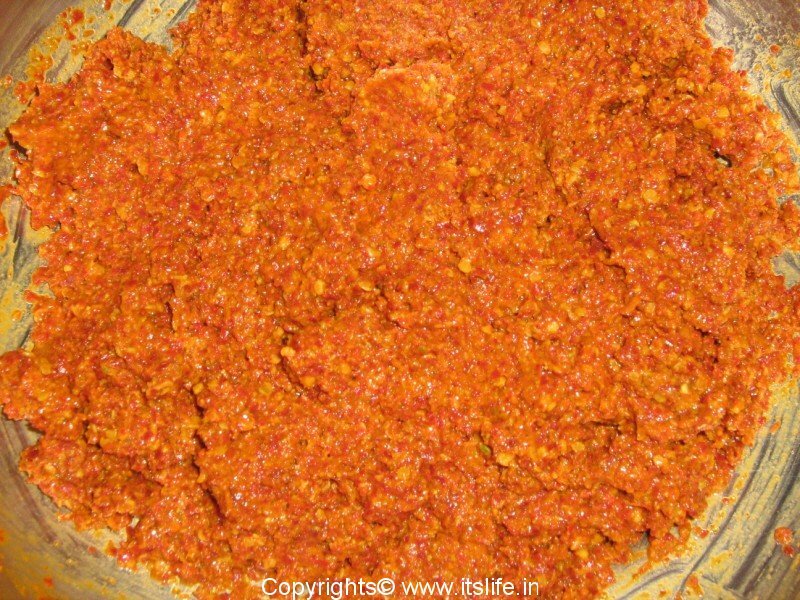 Grind Red Chilies separately to a powder. Add these two powders to the Tamarind extract and let it soak for half an hour. Grind this mixture again. 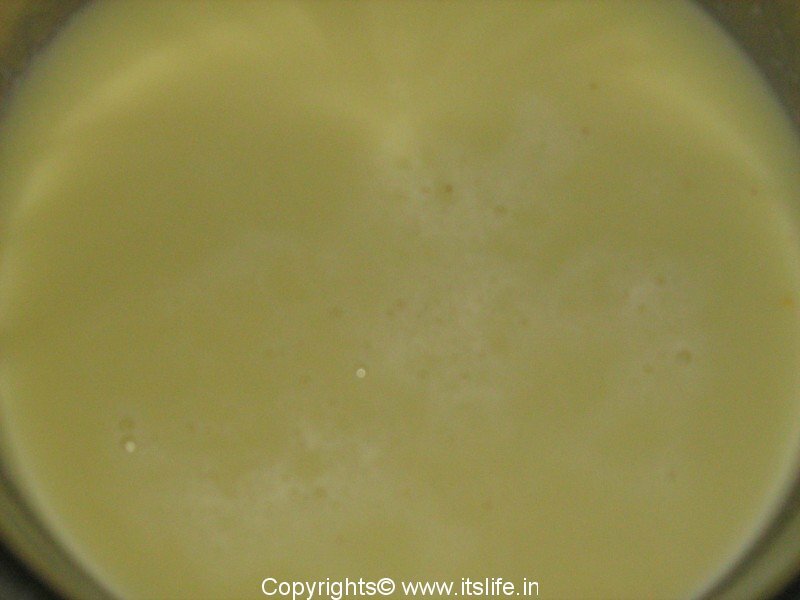 If the mixture is too thick add more Salt water (ensure that the Salt water is boiled and cooled). 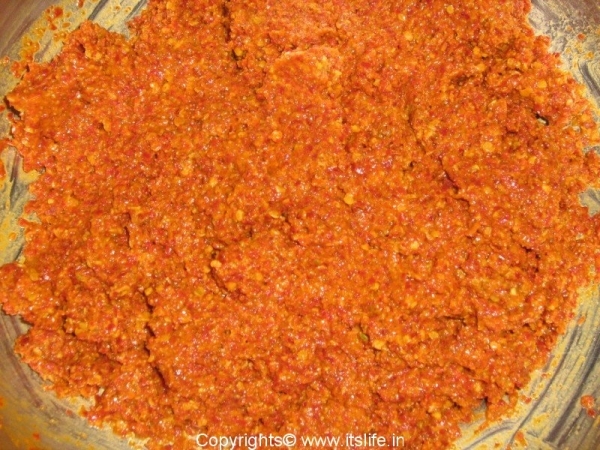 Mix crushed Gooseberries, Tamarind Masala, Magali Beru, Mavinakayi Shunthi, the remaining Salt and Green Pepper. Store in dry, airtight containers. Preferably store in the refrigerator. Remove some pickle to a cup. Heat a tablespoon of Oil and add ½ tsp Mustard Seeds and when they splutter add a pinch of Hing/Asafoetida and ½ teaspoon Turmeric Powder. 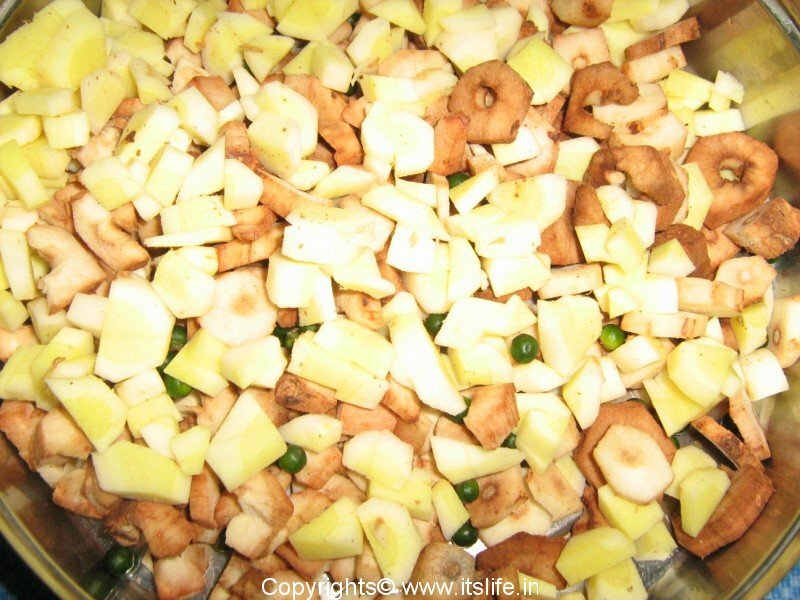 Mix well and serve with hot Rice or Curd Rice. I wonder if this would work with American Gooseberries. I’ll have to try it out! Thanks for the recipe! It will work out with American Gooseberries. Do you enjoy spices? 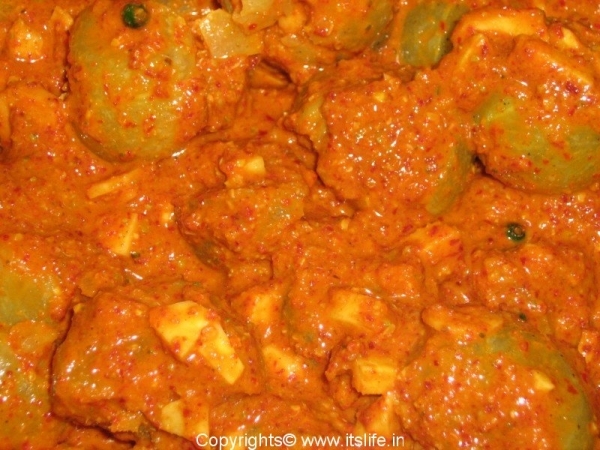 I was looking for Magali beru Uppinakayi recipe and I came across this post of your recipe, Luckily, I had all the required ingredients and decided to give this a try and it turned out awesome. Thank you very much for the recipe, it is awesome. My kids loved it too. I am glad the recipe turned out well, Yogish. Thanks for liking the post Boregowda. Will try and write about the goodness of the ingredients you have requested. while grinding in a blender will it not grind seeds and sippe also? Secondly as far as I remember my mother used to put only sasve and no menthya that too raw sasive ? I wonder if that was a different type or is it the same pickle. Please do not use ripe tamarind. Please grind the masala ingredients and not the Gooseberry. Recipes can vary. You can try the way your mom does and I bet you will love it! 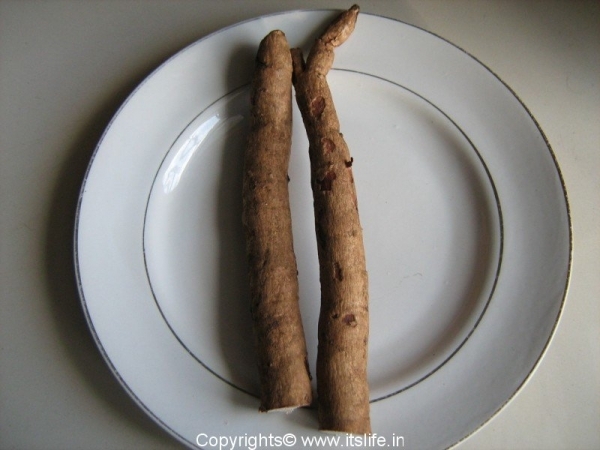 Thank you for posting the recipe…I wanted to know if I can use regular tamarind extract instead of raw tamarind.